IBF, IBO, WBA heavyweight world champion Anthony Joshua (19-0, 19 KOs) is hoping to become a destructive force like of his idols, former undisputed champion Mike Tyson. Joshua, who is trained by veteran coach Robert McCracken, is scheduled to make a mandatory defense on October 28th in Cardiff against Kubrat Pulev of Bulgaria. If Joshua wins the contest, and WBC champion Deontay Wilder (38-0, 37 KOs) defeat Bermane Stiverne the following week - they could be a step closer to a huge unification next summer. While Joshua is often compared to Tyson, and he highly respects Tyson, he says there are very big differences between them. 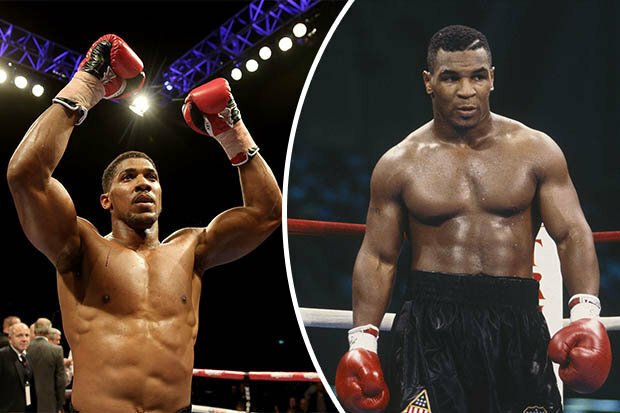 One difference, says Joshua, is when the going got very tough - Tyson would fall apart as he did against Buster Douglas and Evander Holyfield, twice. Joshua proved his heart in April, when he got off the floor in the sixth and withstood some tough rounds to eventually rally and stop Wladimir Klitschko in the eleventh. And another difference, the champ points out, is how opponents were terrified before they ever stepped one foot in the ring with Tyson - while Joshua feels his opponent actually believe they can - and he changes their minds by battering them inside the ring. "I can take people to the trenches and I can turn it into a fight about heart, but I want to show my finesse and Mike Tyson wasn't known for his heart, he was known for his technique, he was known for how great he was on the inside," Joshua told Sky Sports. "A lot of fighters aren't known just for being sluggers and stuff. They are known for being great fighters and that's where I'm trying to get to. That's why I don't call myself the greatest or the most feared fighter, or this or that, because I know I'm going to get to that. But I know I've got bags of heart and I'm willing to go through it to get to that." "People think they can come and beat me. Mike Tyson broke his opponents before they got in the ring, I break them in the ring." I think one key difference is that Tyson just had that mean attitude about him. Tyson wanted to utterly destroy opponents. The way the went about his business with his opponents was just insane. A.J. doesn't have that.